Mass Notification Systems, also known as Emergency Communication Systems, provide real time information to all building occupants or personnel in the immediate vicinity of a building during emergency situations. In a wide scale emergency, keeping people informed is critical to keeping them safe. Notifying more people of a dangerous and potentially life threatening situation can prevent further injuries and save more lives. Such situations require mass notification systems to broadcast live up-to-the minute emergency information to everyone in a building, campus, or multiple facilities spread across a city, state or even the globe. Using a combination of interior and exterior speakers and amber strobes, Notifer’s FireVoice 25/50 will alert an entire building of an emergency situation, and instruct the occupants on the appropriate course of action. 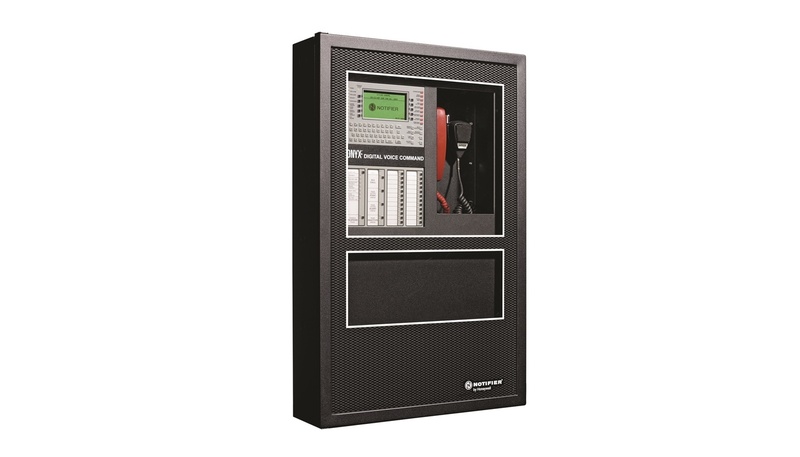 Live emergency paging is easily accomplished using the FireVoice 25/50 integrated microphone. Towering high rises, sprawling college campuses, and mass transit hubs can all have thousands of people occupying them at any given amount. Notifying everyone in these vast areas of an emerging crisis is critical to protecting life safety. Notifier’s Digital Voice Command System makes it possible and can be distributed throughout multiple buildings and linked together via the NOTI-FIRE-NET intelligent network. Each system can operate independently in case of a building-specific emergency, or cohesively as part of unified mass notification system for large-scale emergencies. Using the Digital Voice Command Center, authorized personnel can distribute emergency voice messages to an entire campus or just to specific areas. Notify-IP uses voice over IP technology to send live, direct voice instructions for preserving life and property throughout a large facility, campus or multiple facilities across the world. Large global corporations, as well as the US and foreign governments have facilities spread across the world. Notifying a facility half-way around the world of a pending threat or potential emergency is not easily accomplished with traditional voice evacuation systems. That’s why Notifier harnessed the power of the internet and voice over IP technology to develop Notify-IP. Notifier continuously develops new technologies that improve fire and life safety. All Department of Defense components are required to provide mass notification capability. This UFC (Unified Facilities Criteria) was developed by collecting and refining criteria from DOD antiterrorism guidance, examining previous mass notification system evaluation reports, and reviewing the capabilities of representative, commercially available mass notification products.